Walking is an often overlooked form of exercising. It does wonders for the heart rate, tones the muscles and best of well is really not that stressful when you think about it. 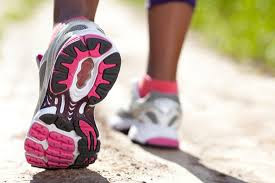 Walking is a great form of exercising which works the heart while also toning the muscles.With the increasingly sedentary life we now live, there’s almost always never any time to exercise, except in cases where people specifically want to lose weight. More than anything is the fact that the average Nigerian doesn’t give much thought to exercising. But the many benefits of exercising cannot be exhausted. 1. Great for the joints: Walking tones the muscles in addition to stimulating and strengthening the bones and joints which is great in fighting off things like arthritis. 2. Give bursts of energy: When you take a healthy walk, there is a boost in circulation and increase in supply of oxygen to cells in the body which wakes stiff joints and eases muscle tension, leaving one feeling less sluggish and more energetic. 3. Walking lowers disease risk: A regular walking habit slashes the risk of type 2 diabetes by around 60 percent, and you’re 20 percent less likely to develop cancer of the colon, breast or womb with an active hobby such as walking. 4. Good for the heart: We can’t get enough of things that are good for the heart because this is a very essential organ whose well-being is pivotal to being alive. When you talk walks, your heart rate goes up which gets the blood pumping and oxygen circulating. This then reduces the risk of heart diseases, stroke and bad cholesterol. 5. Checks the weight: Walking is an easy and effective way to burn calories – and lose weight. According to fitness experts, one can burn as much as 75 calories strolling at 2mph for 30 minutes and 150 calories walking at 4mph. In addition, walking also increase muscle mass and the more muscles one has, the faster the metabolism resulting in losing weight.